For the last three months, the NewMe Accelerator class of spring 2012 has been fully immersed in the entrepreneurial process. The NewMe “founders” have been busy working long days at The Hub in San Francisco and living together in a house nearby. The goal: to develop, design and launch new startup companies. Last week these NewMe founders held their demo day in the Google San Francisco office, where they presented the fruits of their efforts—seven brand new companies—to an audience of more than 100 investors, entrepreneurs and supporters. This is the second year of NewME, a program designed by founder and CEO Angela Benton to be an accelerator in Silicon Valley for minority-led startups from around the country. We’ve been delighted to participate in and sponsor both seasons. Some NewME products have already launched in beta and are live in market. Founder Naithan Jones of AgLocal has 20 farms using the beta version of his Local Meat Lovers Service, which is running in his hometown of Kansas City and in the Bay Area. Similarly, Butlr, Ubi, Helpr, Kairos, Citizen Made and PictureMENU have all hit the ground running. In addition, the reach of NewME has gone beyond Silicon Valley. Through NewMe Communities entrepreneurs all across the U.S. have been getting together monthly to share stories and support. 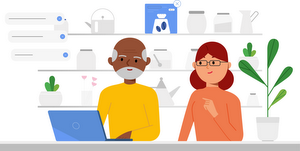 Google supports NewMe as part of our Google for Entrepreneurs and Accelerate with Google programs, which help minority-owned and underrepresented small businesses use online tools to grow. We are committed to supporting diversity in entrepreneurship through great programs like NewMe, and we’re excited to continue working together to ensure diversity of perspectives, talent and experiences within the tech community.